I understand that hungry people hate to wait for a restaurant reservation or hold out for a table at a restaurant that doesn’t take reservations. What I never quiet understood during many years of restaurant work was the anger that customers unleashed on hostesses and managers as though they were actively trying to deny their guests a table. Restaurants want to turn tables and feed as many patrons as possible. Well, the wait for a table might not vanish tomorrow, but maybe the NoWait app can help everyone remain a little more civil throughout the process. NoWait is an iPad app for restaurants that helps casual dining restaurants keep tabs on table availability and send a text to customers when they can be seated. NoWait also provides time estimates and updates to calm starving diners–if they could sync updates with stomach rumbles they’d really have a golden product to offer. Perhaps the biggest problem with waiting for a restaurant table is uncertainty. Will I wait 20 minutes or 40 minutes? Is Famished Jack still waiting for a table at the bar next door, or is he already stuffing his face at a different establishment? The two-way communication of NoWait enables restaurants to give a more detailed, accurate picture of the wait ahead. It allows them to confirm that guests are still waiting, which helps fill empty spaces quicker. And guests have the means to ask a quick question without tying up the front desk. The analytics give restaurants a great tool for monitoring their guests waits. NoWait stores guest information, tracking arrival time, quoted wait estimates, and actual time seated. This gives restaurants a better measure of how they’re filling those chairs. While OpenTable has similar features such as the ability to tally walk-outs, NoWait addresses a space that often falls through the cracks. Anyone else feel like an idiot holding a digital discus while waiting for a table? No one will miss those unwieldy pagers. Customers don’t want to lug them around. Staff will certainly not miss dealing with them, and owners will delight in cost savings for new buzzers or replacement pagers. Using NoWait to book less than 200 parties a month is free for restaurants, with different price plans available for businesses with higher volume turnover. There’s no shortage of companies looking to enter the space of customer wait management. NoWait, Pittsburgh-based, might have the right touches of customer service (those follow up thank you texts go a long way) to set it apart from competitors like OpenTable, Noshlist, Livebookings, and BuzzTable, to name only a few. Birchmere Ventures and Sand Hill Angels led a $2 million round of investment in late August. NoWait has partnered with brand giants like TGI Friday’s and Red Robin, easing the waiting woes of more than 4 million people. Funding will help NoWait expand its client base even further. Prior to becoming CEO for NoWait, Rob Myer worked at EBDS as Director of Solutions Management. He earned an MBA at Carnegie Mellon University and a Master’s Certificate in Project Management from the University of Pittsburgh. The NoWait platform was built at the AlphaLab Tech Accelerator with seed funding from Carnegie Mellon and innovation Works. 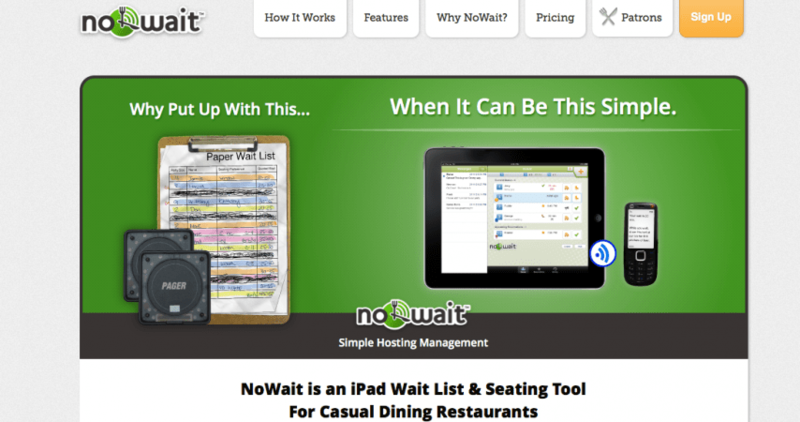 For diners looking to try their luck without a reservation and for restaurants looking to simplify customer wait management, the NoWait iPad app for restaurants facilitates an easy texting interaction.